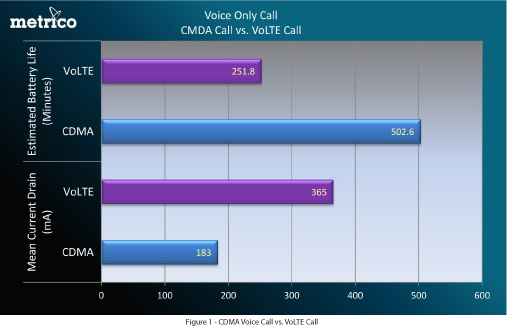 According to a recent study, a test of battery life between 3G (CDMA) and VoLTE showed a 50% reduction when placing calls over LTE only. The test apparently took place over an unnamed U.S. operator’s network in two major markets using a smartphone that was capable of making both VoLTE and CDMA calls. We do not know the specific device, only that it was using a fully charged 1540mAh battery. During the test, the device lasted 252 minutes over VoLTE and 503 minutes on CDMA. It’s tough to say why the drain happened so quickly, but the author of this study tossed out the idea that when using VoLTE only, you are only using the LTE chip, which could result in a larger drain. I don’t know that I necessarily buy into that idea, since we spent the first year of LTE complaining about dual-radios and the fact that a device’s battery was horrible because it had to power both an LTE and CDMA radio simultaneously. One thing I think we should keep in mind, is the fact that VoLTE on Verizon is just now going into major testing, if you could call it that. By the time we get close to launch, which could be towards the end of 2013, I would imagine that devices will be built with VoLTE in mind and with a focus on battery life. Since we don’t know who the carrier was or which device was being used, I wouldn’t call these tests definitive by any means. Still, something to think about.